FIFATV / YouTubeLauren Hemp already had two goals on the day when she scored with her side for a hat trick to lead England to a 6-1 win over Mexico at the U20 Women’s World Cup. English forward Lauren Hemp scored an impressive goal with her stomach at the U20 Women’s World Cup for a hat-trick against Mexico. The score came as Hemp fell directly onto the ball in front of the net, popping the ball out of her side and into the goal. England went on to win the match, 6-1, winning their group and securing a spot in the quarterfinals. The 2018 World Cup gave sports fans some of the most incredible goals of the year – from Romelu Lukaku’s dummy, to Lionel Messi’s supreme control, to Ronaldo’s hat trick. 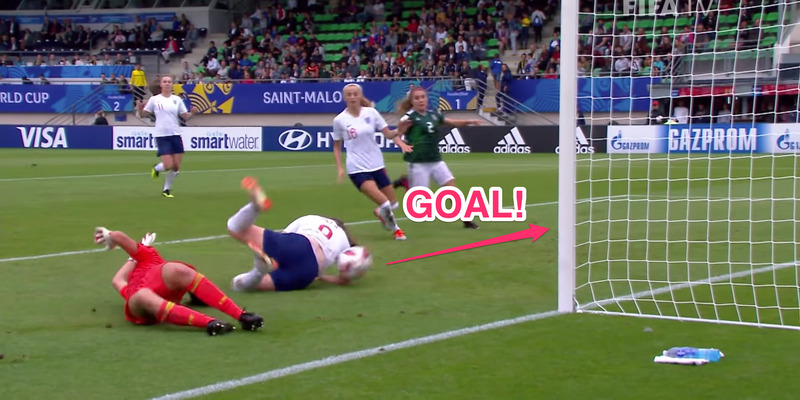 At the U20 Women’s World Cup on Sunday, English forward Lauren Hemp added her name to that list, scoring her third goal of a hat trick with her stomach in one of the oddest goals you’ll ever see. The moment came in the game’s 80th minute, with England already holding a 5-1 lead. 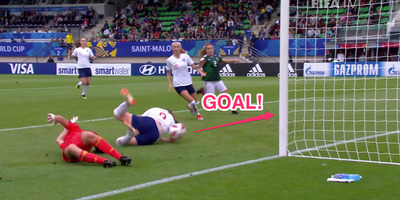 Hemp, who had already scored two nifty goals earlier in the match, chased a ball into the box while hounded by Mexican defender Miriam Garcia. When Garcia slides, Hemp takes a sharp angle towards the goal, and is met by goalkeeper Emily Alvarado. Hemp somehow gets the ball up and over Alvarado, but then trips over the keeper, landing on the ball and essentially squeezing it into the net for her third goal of the game. While the play might look like a random sequence of events that just so happened to work out in Hemp’s favour, on Twitter after the match, she begged to differ. With the win, Hemp and her teammates secured the top spot in their group and are through to the quarterfinal. England will meet the Netherlands on Thursday, just three wins away from lifting the trophy.